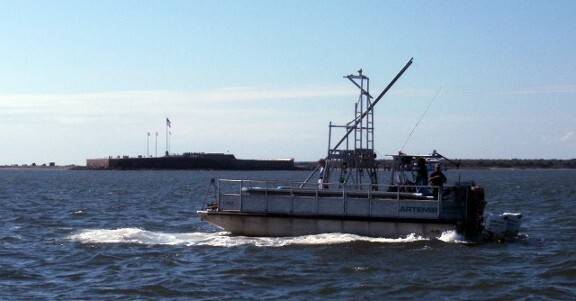 Athena played a crucial role during the data collection phase of the Charleston Harbor Post 45 Study in 2012 and 2013. The South Carolina State Ports Authority and Army Corps of Engineers (Charleston and Wilmington Districts) worked to collect sediment data to assist in the planning of the proposed harbor deepening. This involved a series of vibracore samples for environmental and geotechnical testing in the harbor and offshore in the entrance channel and a large-scale wash probing project in the entrance channel out to 20 miles offshore to determine top of limestone elevations crucial to dredge planning. The Sediment collection phase was performed during October and November of 2012 and involved collecting large volumes of sediment for detailed sediment chemistry analyses to determine potential contamination that could affect the area during dredging. Vibracores up to 20 feet in length were required at 122 locations from the upper harbor out to 8 miles offshore. During March and April of 2013, Athena was called upon to assist in determining the surface elevations of limestone in the offshore portion of the shipping channel out to 20 miles offshore. This involved the use of a wash probe at 203 sites (see map below), a pipe using a jet of water to blast through unconsolidated sediment, to push through the soft sediments to the top of the limestone. This information is important in the planning of dredging operations to provide as much data as possible to reduce costs and unexpected site conditions. Athena continues to be active in collecting geotechnical and environmental sediment data in support the ongoing expansion of port facilities in conjunction with the main channel deepening.